In preparation for swine-flu vaccinations next month, the state’s Health Department on Thursday temporarily suspended a rule that limits the amount of a mercury preservative in vaccines given to pregnant women and children under the age of 3. 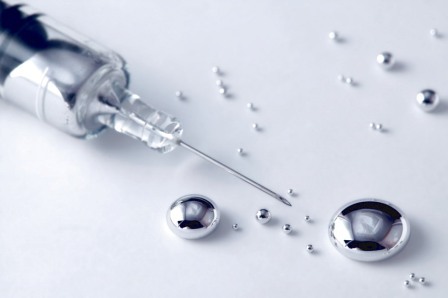 About 15 percent of the vaccine supply will be mercury-free, but people may have to wait longer for it to become available. U.S. Health and Human Services Secretary Kathleen Sebelius said Thursday that 6 million to 7 million doses of the vaccine will be available the first week in October, mainly in the form of a nasal spray called FluMist. About 40 million flu shots should be ready by the middle of October, with an additional 10 million to 20 million doses rolling off the assembly lines every week after that for a total of 250 million doses. The vaccine itself will be free, Sebelius said, but health-care providers can charge to administer it. Thimerosal will be added to the vaccine because it is being produced in vials that contain enough medication for 10 shots. The mercury compound kills bacteria, lowering the risk that the drug will be contaminated by needles used to withdraw separate doses. “Every time you introduce a needle, you run a risk of introducing a potential contaminant,” said Dr. Tony Marfin, state epidemiologist for infectious disease. Mercury-free vaccine will be produced in single-dose vials. Nasal sprays do not contain mercury but are not recommended for children under the age of 2 and pregnant women, because they contain live, weakened virus. An analysis published Thursday also found that the nasal spray is less effective than shots in adults under 50. Selecky said the law limiting the mercury preservative will be suspended for six months and applies only to the swine-flu vaccines. Once common in vaccines, thimerosal has been largely phased out in most wealthy nations. Children’s vaccines in the United States are almost exclusively mercury-free, single-dose injections. However, numerous studies have found no link between thimerosal and disorders in children. Early results with the new vaccine against swine flu, technically known as H1N1, show it quickly induces a strong immune response, and most people over the age of 10 will require only a single dose. The rate of side effects also appears to be low. Out of nearly 44,000 people inoculated in China, 14 “adverse events” have been reported, all very mild, said Dr. Marie-Paule Kieny, director of the World Health Organization’s (WHO) Initiative for Vaccine Research. WHO and the Centers for Disease Control and Prevention (CDC) will carefully monitor side effects, she said. After 1976’s mass vaccination against a different swine-flu strain, about 500 people developed a neurological disorder called Guillain-Barre Syndrome (GBS), and some died.